Video poker is one of the most exciting arcade games and as such, it is no surprise that it gained in popularity so much. It appeals to hundreds of players worldwide as it has proven to be not only challenging but also entertaining. Since it is a casino game that besides luck, also requires a strategy, many avid players opt for it as it gives them the opportunity to put their skills to the test. If they manage to apply their chosen strategy correctly, they can influence the final outcome of the game to a huge extent and increase their chances of winning significantly. 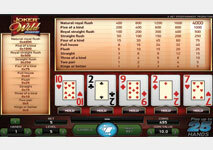 Video poker, just like many other popular casino games, has a number of different variations. 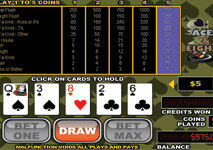 Each one is similar in nature to the standard video poker game as it uses the same basics and fundamental principles, however it has also some unique features and rules. For instance, the standard video poker game, commonly known as Jacks or Better, has no wild cards, whereas the popular variation Deuces Wild does. Once players have learned how to play the standard game, they will be able to easily grasp the rules of the rest of the variations. Due to the huge diversity of video poker variations, it can be very hard to decide which one to play and which one to avoid. Therefore, let’s have a look at some of the most popular video poker games and their best features. In general, it is always a good idea to look for full pay machines and to bet the maximum amount of coins, regardless of the video poker version. Jacks or Better, also known as Draw Poker, is the most popular variation of video poker which gained in popularity quickly due to its simple nature. This is the reason why the game is suitable for novice players as it is very easy to grasp its rules and principles. Moreover, it is extremely beneficial to get familiar with them as they serve as a basis for the rest of the variations. It is considered to be the first video poker game, released in the 1970s. This version is played with a standard deck of 52 cards and as its name hints, the lowest winning combination is Jacks or better. The odds of getting a paying hand are quite high which also greatly contributes to increasing popularity of this game. This version can be very favorable for the players as long as it is played on a full pay machine. 9/6 Jacks or Better or in other words full pay Jacks or Better is the game which they should seek in order to have the biggest chances of winning in the long run. The reason why these games give players the best winning odds is that their expected return is 99.54%. If players have a reliable strategy, money management skills and discipline, it is possible to make a profit in the long term while playing Jacks or Better. 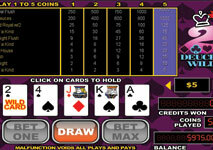 Deuces Wild is another very widespread variation of the ever-popular video poker game that can be found in a number of casinos. Its name refers to the fact that in this variation all 2’s, regardless of their suit, are valued as wild cards. In video poker, players can use wild cards to substitute any card they wish in order to form a winning combination. For instance, if they have an Ace, a 5, and a 2, the 2 becomes an Ace and as a result, players have a strong pair of Aces. The game is played with a standard pack of 52 cards and four deuces wild and the lowest winning hand is Three of a Kind. There are many variations of Deuces Wild but the most popular among them is the Full pay game as it offers the most beneficial expected return – 100.76%. This is the reason why it is one of the most played versions as it has proven to be not only extremely exciting but also profitable. It should be noted that it is possible to win in the long term only on the condition that players apply a reliable strategy correctly and manage their funds successfully. Additionally, there is a difference between the wild cards in video poker and the wild cards in the standard poker game. In video poker, the payout for “unnatural” hands or in other words, the winning combinations that are formed by using wild cards, is much smaller. For example, a Royal Flush formed without wild cards pays 4000 coins, whereas the same winning combination that feature wild cards pays only 125. Full pay Deuces Wild gives players really good chances of winning and making a profit in the long term, only if they follow a reliable strategy. Double Bonus is also one of the most popular games when it comes to video poker. The lowest winning hand in this version is a pair of Jacks and the game is played with a standard pack of 52 cards. It offers two bonus payouts for the winning combination Four of a Kind. It also features a generous payout for a hand of 4 Aces which is 800 coins for a 5-coin bet. Furthermore, if players manage to collect four 2’s, 3’s or 4’s, they will get 400 coins. The payout for 5’s-kings is 250 which is still a decent amount. The expected return is 100.17%, providing that players play 10/7 Double Bonus and bet the maximum amount of 5 coins. In order to win in the long term, they should also utilize a reliable strategy and adjust it accordingly. Aces and Eights is a video poker variation that is pretty much the same as Jacks or Better, with the difference that it offers higher payouts for 4 Aces or Eights. Usually, the payout bonus for these winning combinations is 400 coins, whereas the standard payout for Four of a Kind is only 125. The expected return for Full pay Aces and Eights, providing that it is played with the maximum amount of coins and a perfect strategy, is 99.78%. Even though the basic rules and gameplay are the same as in Jacks and Better, the payout percentage in this version appears to be higher. There are various Aces and Eights machines which offer diverse pay tables which is the reason why players should always take their time to double check them in order to make sure the game works in their favor. The best variation they can play is 25/8 Aces and Eights as this is the game that pays the most money. In such games, players get paid out 25 to 1 for a Four of a Kind and 8 to 1 for a Full House. This type of games gives players better chances of winning as the house edge is much lower. Jokers Wild or also called Joker Poker, is one of the very few video poker variations that uses a 53-card deck. The additionally included card is the joker which serves as a wild card, meaning that players can use it in order to form winning combinations. Thus, it is much easier to make strong hands and this is the reason why the minimum payout is different in comparison to the rest of the variations. In most cases, the lowest winning hand that players can form is a Pair of Kings, a Two pair or a Pair of Aces and it depends on the specific video poker machine and the casino. Most widespread Jokers Wild games offer an increased payout for the winning combination Five of a Kind. The payout differs from one variation to another, but in most cases, it is either 500 or 1000 coins. The game itself has three different versions – Kings or Better, Two Pairs or Better and Aces or Better. Their names show the lowest winning combination that can be formed in the respective variation. The best version among these is Kings or Better as it gives players the best payout percentage. Full-pay Kings or Better Jokers Wild, played with 5-coin bets and a perfect strategy, has an expected return of 100.64%. 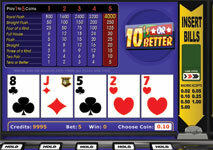 Tens or Better is a popular variation of video poker that highly resembles Jacks or Better. This game is suitable for players who intend to play for a shorted period of time as it offers small winnings. 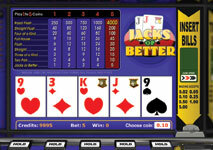 Video poker enthusiasts who want higher payouts and better chances of winning big should opt for Jacks or Better. Even though the minimum winning hand is a Pair of Tens, the payouts for a Full House and a Flush are also much lower and as a result, players win less money than usual. The highest winning combination remains a Royal Flush, just like in the rest of the most widespread variations. Tens or Better offers an expected return of 99.13%, providing that players bet the maximum amount of coins and of course, use a reliable strategy. This version also has the so-called Gamble Feature which enables players who have formed a winning combination to double their winnings. This extra round is optional and it is possible to either participate in it or continue playing. 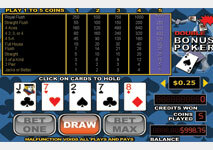 Video poker is one of the most exciting casino games as it is a game of both pure chance and luck. Nowadays, video poker enthusiasts have the opportunity to enjoy Wild Deuces, Jokers Wild, Double Bonus, Aces and Eights and other versions and significantly diversify their gaming experience. Some of the variations offer special bonuses, whereas others feature wild cards which give players the chance to form winning combinations much easier. Players can give a try all of the variations and find the game that suits their personal preferences best. However, before playing, it is advisable to double check their rules and pay table in order to make sure the game is beneficial enough.